It’s that time of year again. The leaves begin falling from the trees. The air gets a little crisper. You start looking silly wearing your summer clothes. And, of course, consumer electronics get refreshed for the wait-what-it’s-here-already? holiday season. On Wednesday, Roku updated three-quarters of its streaming set-top models with designs that match the Roku 3, and with improved features and a new content partner that’s important enough to garner a coveted button spot on the Roku remote—all at the same prices as before. Joining the existing $100 Roku 3 are a new version of the $50 Roku LT, the new $60 Roku 1 (replacing the Roku 2 HD), and the new $80 Roku 2 (replacing the 2 XD). The new models all take on the indented-hockey-puck look of the Roku 3. Feature-wise, the Roku 2 gains a headphone jack on the remote for private listening, as well as dual-band Wi-Fi—both previously available only on the top-of-the-line Roku 3. The Roku 1 supports 1080p video, lowering the bar for higher HD resolution to the $60 price point in Roku’s lineup—and leaving the Roku LT as the only model that tops out at 720p. The Roku 3 remains the premier model with a faster processor, ethernet and USB ports, and a motion-control remote for gaming. The new face of remote control. To show how serious M-Go and Roku are about the partnership, M-Go is getting a dedicated launch button on the new Roku remotes, alongside Netflix, Amazon, and Blockbuster. M-Go tries to distinguish itself from other nonsubscription video services (Vudu, iTunes Store, Amazon, and so on) by focusing on features related to personal relevance: custom lists (Cards) for quick access to favorite shows, movies, actors, and directors; the ability to fine-tune recommendations; and even links to other services that offer the content you’re looking for. M-Go is currently available on a number of smart TVs, certain Google TV hardware, and Android devices, as well as via a Web browser. 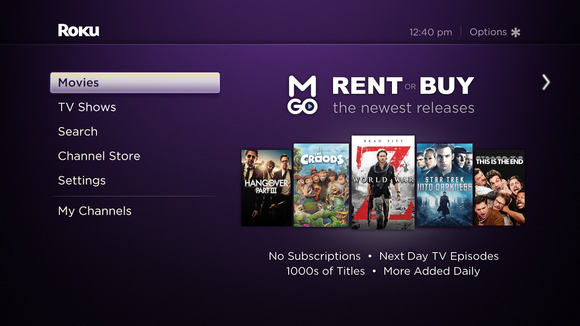 M-Go finds a new friend in Roku. All three new Roku models will be available in October in the United States, Canada, the United Kingdom, and Ireland. 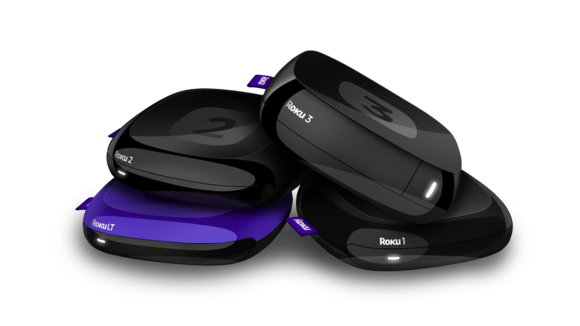 Roku also announced that the Roku 3 will be available in the same non-U.S. markets starting Wednesday. Although the Apple TV recently gained several new channels, Roku remains the undisputed king of content with more than 1000 channels in the U.S., and more than 450 in Canada, the U.K., and Ireland. According to the company, Roku customers streamed a staggering 1 billion hours of content in 2012, at an average of 13 hours per week per user.